Smash avocado on a plate until smooth. Sprinkle with a bit of sea salt and blend together. Toast baguette rounds until lightly browned. 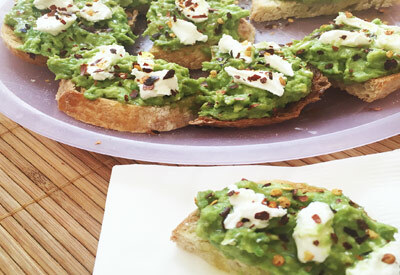 Spread smashed avocado over toasted bread. Add a dollop or two of goat cheese. Sprinkle with red pepper flakes and a very light drizzle of olive oil.